If the days are for sightseeing when you visit England, the nights often belong to the pub — the perfect place to sip foamy ale, enjoy good company and unwind just like the locals do. But the traditional drinking holes — soaked in ambiance and history — are disappearing at a rate that’s alarming many people, with hundreds closing each year because of changing economics and lifestyles. There were almost 68,000 pubs across the U.K. in 1982, but that number has now dropped to less than 50,000, according to the British Beer & Pub Association. 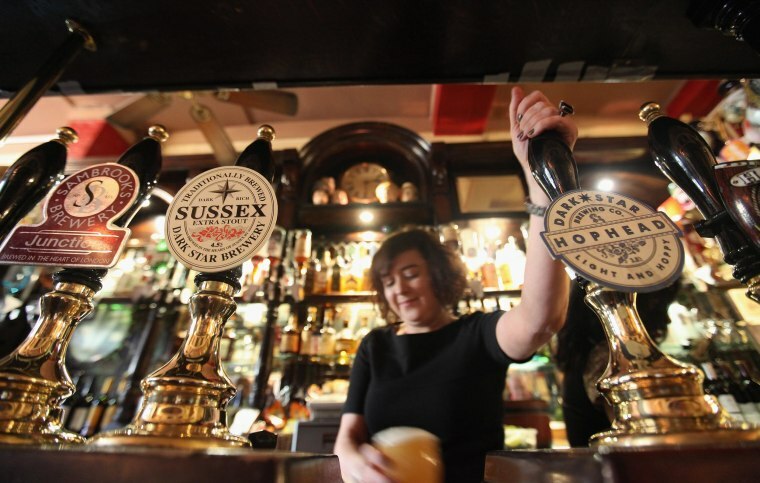 The establishments are “under threat as never before” as many owners seek to convert them to other uses, warns The Campaign for Real Ale, a British consumer group that promotes traditional pubs. The shift has particularly been felt in London, where sky-high real estate prices have led some pub owners to cash in and sell the buildings to developers, who then transform them into houses and apartments. That’s outraging many residents who say their neighborhoods are not only losing a place to socialize, but their flavor and heritage. “A very important piece of our culture, society and social history will die unless we do something about it,” said James Watson, one of the organizers of Save the Chesham, a community group that’s fighting to reopen The Chesham Arms. The 148-year-old pub in the Hackney area of London was abruptly shuttered in 2012 after a developer bought it for 650,000 pounds, or more than twice what it would have been worth as a pub, Watson said. The building's fate is in limbo until September, when the local council will decide what happens next. Pubs make good development projects because they’re usually big and attractive buildings on interesting lots, said Roger Smith, director of Parsons Green Land, a company that’s completed about a dozen pub conversions. But public outcry has led to laws that make it more difficult for buyers to transform pubs into residences. Since 2011, residents can nominate a pub to be listed as an Asset of Community Value, which grants some protections. Smith’s latest project involves The Cross Keys, a pub that opened its doors in 1708 and hosted guests as varied as Agatha Christie and Bob Marley. When previous developers tried to change it into a grand house, local residents berated them for trying to build a “McMansion” and the local council ultimately did not allow the conversion. So Smith’s company bought the building and plans to reopen it with a pub on the ground floor and four flats on the floors above. Smith believes it’s the perfect solution. “A very important piece of our culture, society and social history will die unless we do something about it." Clive Watson, whose City Pub Company owns 18 pubs, has done similar deals by selling off parts of his establishments to developers while keeping the pubs going. Such an arrangement “works very well,” he said. Meanwhile, the red-hot real estate market stays on his radar. There are other reasons for the declining number of old-fashioned British pubs, he noted. Many don’t offer a good menu — a big mistake when food accounts for almost half of sales in modern pubs, Watson said. Then there’s the price of alcohol. Twenty years ago, beer in a pub would cost about as much as beer bought in a supermarket, but supermarkets are now selling alcohol at a third of the price, Watson noted. He believes “pubcos” — companies that bought hundreds of pubs only to have to sell many of them off to stay afloat — have caused much of the problem. Other pubs have closed because there were too many of them in the first place, Thomas said. But don’t worry about these British favorites becoming an endangered species, he added. “The pub will be there forever, I promise you that,” Thomas said.